12 augustus 2017: Bron: PLOS one, online september 2014. Dat immuuntherapie met dendritische celtherapie bij hersentumoren van het type Glioblastoma multiforme (GBM) wel degelijk zin kan hebben blijkt uit een reviewstudie. De overall overlevingspercentages per jaar geanalyseerd staan hieronder maar op 3 jaar is het verschil 20 % (24% vs 4%) tussen wel of geen immuuntherapie met dendritische celtherapie en op 5 jaar 14% versus 0 procent. Echt een wezenljik en statistisch hoog significant verschil. 1 op de 7 patiënten overleeft een hooggradige hersentumor. Een resultaat dat met geen enkele andere behandeling is te halen bij hooggradige hersentumoren. Nog duidelijker uit deze studies blijkt dat 0 procent een glioblastoma de 5 jaar overleeft. Alle reden dus om ons project Utopie of uitdaging door te zetten. Hieornder het schema dat de onderzoekers hanteerden in hun studiekeuze. Uiteindelijk bleven er 31 studies over voor de meta-analyse (Tekst loopt verder onder grafiek). Information on the 1-year survival was available for seven trials –, –. These seven trials contained 354 patients in total (98 patients received DC therapy, and 256 control patients did not receive DC therapy). De 1 jaar overall overleving (OS) was 82% (80/98) voor glioma patiënten die de DC behandeling hadden gekregen, waar de OS 63% (160/256) bleek voor de patiënten uit de controlegroep. The meta-analysis showed a significantly improved 1-year OS for the patients who received DC therapy compared with those who did not (OR 2.89, 95% CI 1.58–5.27, P = 0.0006). Cochran's Q test yielded a P value of 0.09, and the corresponding I2 quantity was 45% (Figure 2A). Information on the 1.5-year survival was available for six trials –, , . These six trials contained 320 patients in total (80 patients received DC therapy, and 240 patients who did not receive DC therapy served as a control).De 1,5 jaar overall overleving was 59% (47/80) voor glioma patiënten die de DC behandeling hadden gekregen, waar deze 28% (66/240) was voor de controlegroep. The meta-analysis showed a significant benefit for the 1.5-year OS in the HGG patients who received DC therapy compared with non-DC therapy (OR 5.13, 95% CI 2.80–9.41, P<0.00001). Cochran's Q test yielded a P value of 0.35, and the corresponding I2 quantity was 10% (<50%), indicating that the degree of variability between the trials was consistent with what would be expected to occur by chance alone (Figure 2A). Information on the 2-year survival was available for seven trials –, –. These seven trials contained 354 patients in total (98 patients received DC therapy, and 256 patients who did not receive DC therapy served as a control). De 2 jaar overall overleving was 34% (33/98) voor glioma patiënten die de DC behandeling hadden gekregen en 14% (35/256) voor de controlegroep. The estimated pooled OR for these seven trials showed a significantly increased 2-year OS for the patients who received DC therapy compared with those who did not (OR 4.69, 95% CI 2.48–8.85, P<0.00001). Cochran's Q test had a P value of 0.50, and the corresponding I2 quantity was 0% (Figure 2A). Information on the 3-year survival was available for six trials –, , . These six trials included 354 patients in total (98 patients received DC therapy, and 256 patients who did not receive DC therapy were used as controls). De 3 jaar OS was 24% (24/98) voor glioma patiënten die de DC behandeling hadden gekregen, versus 4% (10/256) voor de controlegroep. The meta-analysis showed a significantly longer 3-year OS for the patients who received DC therapy compared with those who did not (OR 11.52, 95% CI 4.66–28.45, P<0.00001). Cochran's Q test had a P value of 0.82, and the corresponding I2 quantity was 0% (Figure 2B). Information on the 4-year survival was available for five trials –, . These five trials contained 320 patients in total (80 patients received DC therapy, and 240 patients who did not receive DC therapy were used as a control). The 4-year OS rates were 20% (16/80) for glioma patients receiving DC treatment and 1% (3/240) for the controls. The meta-analysis showed a significant improvement of the 4-year OS in the HGG patients who received DC therapy compared with those who did not (OR 16.61, 95% CI 5.06–54.52, P<0.00001). Cochran's Q test had a P value of 0.97, and the corresponding I2 quantity was 0% (Figure 2B). Information on the 5-year survival was available for two trials , . These two trials contained 216 patients in total (42 patients received DC therapy, and 174 control patients did not). De 5 jaar OS was 14% (6/42) voor glioma patiënten die een DC behandeling kregen, versus 0% (0/174) voor de controlegroep. The meta-analysis showed a significantly greater 5-year OS for the patients who received DC therapy compared with those who did not (OR 44.40, 95% CI 5.00–394.16, P = 0.0007). Cochran's Q test had a P value of 0.69, and the corresponding I2 quantity was 0% (Figure 2B), indicating that the degree of variability between the trials was consistent with what would be expected to occur by chance alone. Figure 2. Comparison of 0.5-, 1-, 1.5- and 2-year overall survival (OS) between the non-DC and DC groups (A); Forest plot for 3-, 4-, and 5-year OS between the non-DC and DC groups in HGG patients (B). The fixed-effects meta-analysis model (Mantel-Haenszel method) was used. OR, odds ratio. DC, DC-containing therapy; non-DC, non-DC-containing therapy. Each trial is represented by a square, the center of which gives the odds ratio for that trial. The size of the square is proportional to the information in that trial. The ends of the horizontal bars denote a 95% CI. The black diamond gives the overall odds ratio for the combined results of all trials. 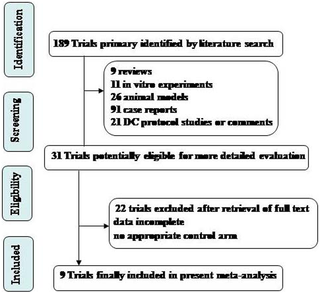 Het volledige studierapport: Clinical Efficacy of Tumor Antigen-Pulsed DC Treatment for High-Grade Glioma Patients: Evidence from a Meta-Analysis is gratis in te zien. The effectiveness of immunotherapy for high-grade glioma (HGG) patients remains controversial. To evaluate the therapeutic efficacy of dendritic cells (DCs) alone in the treatment of HGG, we performed a systematic review and meta-analysis in terms of patient survival with relevant published clinical studies. A total of 409 patients, including historical cohorts, nonrandomized and randomized controls with HGG, were selected for the meta-analysis. The treatment of HGG with DCs was associated with a significantly improved one-year survival (OS) (p<0.001) and 1.5-, 2-, 3-, 4-, and 5-year OS (p<0.001) compared with the non-DC group. A meta-analysis of the patient outcome data revealed that DC immunotherapy has a significant influence on progression-free survival (PFS) in HGG patients, who showed significantly improved 1-,1.5-, 2-, 3- and 4-year PFS (p<0.001). The analysis of Karnofsky performance status (KPS) demonstrated no favorable results for DC cell therapy arm (p = 0.23).The percentages of CD3+CD8+ and CD3+CD4+ T cells and CD16+ lymphocyte subset were not significantly increased in the DC group compared with the baseline levels observed before treatment (p>0.05), whereas CD56+ lymphocyte subset were significantly increased after DC treatment (p = 0.0001). Furthermore, the levels of IFN-γ in the peripheral blood of HGG patients, which reflect the immune function of the patients, were significantly increased after DC immunotherapy (p<0.001). Thus, our meta-analysis showed that DC immunotherapy markedly prolongs survival rates and progression-free time, enhances immune function, and improves the efficacy of the treatment of HGG patients. Conceived and designed the experiments: ZXW JXC. Performed the experiments: ZXW JXC XYZ JL-Liu YSL MW DL JL-Li BLX HBW. Analyzed the data: JXC XYZ JL-Liu YSL DL MW JL-Li BLX HBW. Contributed reagents/materials/analysis tools: JXC DL MW. Contributed to the writing of the manuscript: ZXW JXC XYZ JL-Liu. 1. Louis DN, Ohgaki H, Wiestler OD, Cavenee WK, Burger PC, et al.. (2007) The 2007 WHO classification of tumours of the central nervous system. Acta Neuropathol. 114(2):97–109. Epub 2007 Jul 6. 7. Fabry Z, Raine CS, Hart MN (1994) Nervous tissue as an immune compartment: the dialect of the immune response in the CNS. Immunol Today. 15(5): 218–224. 15. Mineharu Y, Castro MG, Lowenstein PR, Sakai N, Miyamoto S. (2013) Dendritic Cell-Based Immunotherapy for Glioma: Multiple Regimens and Implications in Clinical Trials. Neurol Med Chir (Tokyo). 53(11):741–754. Epub 2013 Oct 21. 18. Yamanaka R, Homma J, Yajima N, Tsuchiya N, Sano M, et al. (2005) Clinical evaluation of dendritic cell vaccination for patients with recurrent glioma: results of a clinical phase I/II trial. Clin Cancer Res. 11(11): 4160–4167. 19. Wheeler CJ, Das A, Liu G, Yu JS, Black KL (2004) Clinical responsiveness of glioblastoma multiforme to chemotherapy after vaccination. Clin Cancer Res. 10(16): 5316–5326. 20. Liau LM, Prins RM, Kiertscher SM, Odesa SK, Kremen TJ, et al. (2005) Dendritic cell vaccination in glioblastoma patients induces systemic and intracranial T-cell responses modulated by the local central nervous system tumor microenvironment. Clin Cancer Res. 11(15): 5515–5525. 21. Kikuchi T, Akasaki Y, Irie M, Homma S, Abe T, et al. (2001) Results of a phase I clinical trial of vaccination of glioma patients with fusions of dendritic and glioma cells. Cancer Immunol Immunother. 50(7): 337–344. 22. Yamanaka R, Abe T, Yajima N, Tsuchiya N, Homma J, et al. (2003) Vaccination of recurrent glioma patients with tumour lysate-pulsed dendritic cells elicits immune responses: results of a clinical phase I/II trial. Br J Cancer. 89(7): 1172–1179. 23. Yu JS, Liu G, Ying H, Yong WH, Black KL, et al. (2004) Vaccination with tumor lysate-pulsed dendritic cells elicits antigen-specific, cytotoxic T-cells in patients with malignant glioma. Cancer Res. 64(14): 4973–4979. 32. Hussain SF, Heimberger AB (2005) Immunotherapy for human glioma: innovative approaches and recent results. Expert Rev Anticancer Ther. 5(5): 777–790. 2 Reacties op "Immuuntherapie met dendritische celtherapie voor hersentumoren type glioblastoma multiforme geeft 20 en 14 procent overall overleving versus 4 en 0 procent op 3 en 5 jaar ." Mijn man heeft een glioblastoom en is onlangs geopereerd en heeft nu 33 bestralingen en temodal waar kan ik info vinden om in contact te komen met ervaringsdeskundigen over de immuuntherapie. Beste mevrouw nieuwkoop, ik heb u een mail gestuurd. Misschien wilt u daarop reageren, zodat ik u mmischien verder kan helpen?